Some memory card readers are faster than others and on different operating systems. To find out which reader is the best, I put all the most popular USB 3.0 UHS-II memory card readers to the test. Since read speeds are the most important for photographers, I’ve made this list in the order of fastest readers based on read speeds. Tested on the MacBook Pro using USB3.0 and the Yosemite 10.10.3 operating system. Software used was Blackmagic Disk Speed Test. Tested on a Macpro running bootcamp with a USB 3.0 card installed. Operating system is Windows 8, software used is Crystal Disk. The fastest UHS-II card readers by far are the Lexars. The SR2 and the Lexar UHS-II Reader (bundled with some of the Lexar cards) are the fastest at read speeds. The Lexar Dual Slot SD / CF reader had the fastest write speeds with decently quick read speeds. If you already have a UHS-II SD memory card, then these readers are the way to go. Memory card speeds are much quicker on Windows 8 than on OSX Yosemite. I’m not sure exactly why, could be the way the software works, or Windows just has better drivers for dealing with USB 3.0 and UHS-II. Likely the latter. 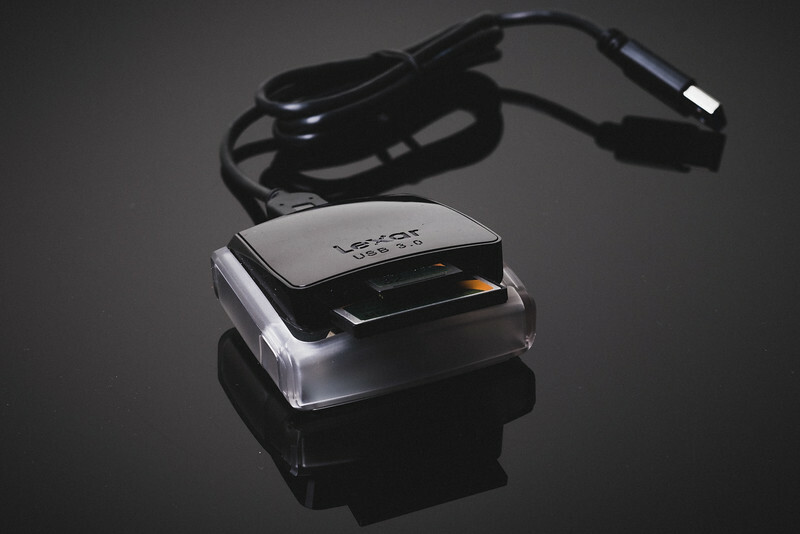 Lexar Dual Slot CF / SD card reader – Out of all these card readers, this is my favorite. It’s very quick, it also takes CF cards and has what feels like the best build quality. Lexar bundled reader, WEme, Sandisk Extreme Pro, Kingston – Also nice because they all plug straight into your USB 3.0 slot. No cables. The Sandisk Extreme Pro has the thumb switch which retracts the USB3.0 connector – like they do in their thumb drives. This would allow you to use the card reader as a thumb drive very nicely because when the card is inserted and the USB3.0 connection is extended (plugged into the computer), the SD card is not visible. If I were to get a card reader that could second as a thumb drive, the Sandisk Extreme Pro would be my first choice. The Delkin CF / SD card reader feels like a cheap toy from the 1980’s. My least favorite plus it has a non removable cable attached. I don’t love the V.Top, feels cheap and has a non removable cable attached like the Deklin. Out of all these compact cable free SD card readers, the Lexar and WEme feel cheap – like they will break soon. WEme feels a little better. Right now there are only a handful of cameras that can take advantage of UHS-II speeds. If you don’t own one of these cameras, you won’t see any speed advantage when shooting photography. The only speed advantage from UHS-II will come from USB 3.0 transfer speeds. Use this guide to decide what’s best for your needs. Just make sure your computer has USB 3.0, or the fastest read or write speeds you’ll get is around 90 MB/s no matter which card you use.